Struppi Hanneford (1931-2014) was a major star aerialistAny acrobat working above the ring on an aerial equipment such as trapeze, Roman Rings, Spanish web, etc. before becoming a high-wire dancer, a wild animal trainer, and eventually, one of the United States’ foremost circus producers along with her husband, Tommy Hanneford (1927-2005). Her circus career, both as an artist and a producer, spanned the entire second half of the twentieth century and the first decade of the twenty-first. She was born Gertrude Zimmerman on September 26, 1931 in Speyer, a small town in Rhineland-Palatinate, near Mannheim in Germany. Her family had no connection with the circus or the performing arts: Her father was a baker, and her mother a homemaker. Yet at a very young age, Gertrude showed a keen interest for gymnastics and all things physical, which was strongly encouraged by her parents—in a country where, at the time, physical education was kept in very high regard. As a little child, Gertrude used to hang from a bar that her father held with his hands; she enjoyed it, and created little routines of her own. When she was seven, her mother heard of a former trapeze artist whose husband was in the military, and who gave trapeze lessons to augment the family income. 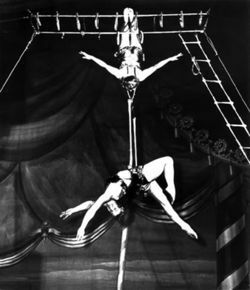 Thus Gertrude (Trude) Johann entered the life of Gertrude Zimmerman and became her trapeze teacher. Trude Johann is also credited with giving Gertrude the nickname under which she would be known for the rest of her life, "Struppi." It was a diminutive of Struppigel, a made-up word that is hard to translate, but would mean something like "hedgehog turned wild," perhaps a good description of what Gertrude’s character was like then—and indeed in adulthood Struppi was a very strong woman, in all meanings of the term. Little Struppi showed good dispositions for trapeze, and eventually Trude built an act for her. She believed Struppi was ready to perform, but WWII had broken out and it was not the best time to start a career if you were not born into the business: The project didn’t come to fruition. Furthermore, as the war dragged on, life became increasingly difficult in Germany, and Struppi and Trude’s worlds eventually drifted apart. Nonetheless, Struppi continued training in gymnastics, took ballet classes, and dreaming of participating one day in the Olympics (which had been held in Berlin in 1936 and had left a strong impression on the five-year-old girl she was then), she also began to train in Competitive Diving. Meanwhile the Wehrmacht had drafted Struppi’s father; some time later he was killed in action. Trude, too, had lost her husband. To survive, she had opened a small gymnastics school in Speyer, and in 1945, as the War came to an end, Struppi returned training with her. But the immediate post-war situation in Germany was abysmal, and Trude, who had two children of her own, needed to make a better living; so did Struppi, whose family didn’t fare much better. Therefore Trude decided to resume her performing career, and she built a new aerial act for her and her best student, Struppi. Thus the Luvas Sisters were born. The name had been invented from scratch, and if they were not really sisters, they were both certainly good-looking and talented. They performed a combination act involving aerial cradlePiece of apparatus (generally aerial) composed of two horizontal parallel bars in which a catcher locks his legs to be in position of catching a flyer. (Variant: Korean Cradle. ), trapeze, and upside-down loop walking, which was novel and spectacular enough to ensure them work. It was not that easy, however: Germany, which had been the epicenter of the circus and variety business in Europe before the War, laid now in ruins—its many circus buildings and variety theaters destroyed, and most of its traveling circuses unable to resume their activities. If the rest of Europe could manage a little better, money was still scarce, and German acts were not welcome everywhere. However, Luvas Sisters was a good name in that it didn’t sound especially German, and after a few engagements in Germany—including one with Circus Krone in Munich, which has just been authorized to resume its activities for a show that was filmed for American television—they went on to work in a series of stage shows in England, followed by a season at Cirkus Scott, Sweden’s premier circus. By 1952, good offers were numerous enough to give them the luxury to choose. One offer came from Jake Mills in the United States, whose Mills Bros. Circus was a big importer of European acts after the War. (The Mills brothers, Jake, Jack, and Harry, were themselves Russian immigrants.) Going to America was a childhood dream for Struppi, and also—more importantly—there was no shortage of money there. 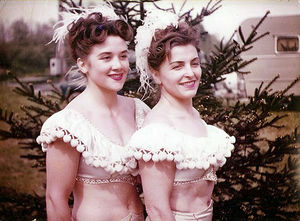 The problem was that the Millses, like most American producers, expected the Luvas Sisters to perform more than one act. Trude’s father had trained dogs, so it was something she had a minimum of familiarity with; they added a dog act to their repertoire. The Luvas Sisters made their American debut with the Mills Bros. Circus for its 1953 season. Their contract was renewed for the following year, but the hiatus during the winter months proved much harder than they expected: The United States didn’t have winter circuses, as in Europe, and they didn’t know anybody in the business besides the Millses. The Mills Bros. Circus toured mostly in the Midwest and did one-day stands—not an ideal situation to make new contacts. Nonetheless, they had met a circus fan that had told them to let him know if ever they needed anything; they reach out to him and he helped them not only to go through the winter months, but also to get their Green Cards (U.S. Resident Status). During their second season with the Mills Bros. Circus, Trude and Struppi became a little more attentive to the ways of the circus business in the United States. They saved money and began immediately to look for winter contracts. Al Dobritch, one of the country’s foremost agents (and soon an important producer), gave them a contract to appear in Super Circus, a hit children television show at the time on ABC. This was a good exposure, and Dobritch found them more dates, notably with the Shrine circuses produced by Orrin Davenport. Their American career took off. In 1955, Struppi Luvas met Tommy Hanneford for the first time; they worked in the same Davenport show, she with Trude, and he with his father and siblings in the George Hanneford Family jockeyClassic equestrian act in which the participants ride standing in various attitudes on a galoping horse, perform various jumps while on the horse, and from the ground to the horse, and perform classic horse-vaulting exercises. act. They met again on yet another show, and Tommy and Struppi fell in love. They were married December 8, 1955 during a date in Chicago. The Luvas Sisters had their contracts lined up for the 1956 season, however, and they didn’t not necessarily coincide with the Hannefords’ contracts. 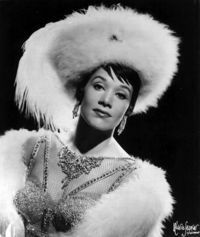 One of the Luvas Sisters’ contracts was, in April 1956, the prestigious Ed Sullivan Show on CBS television, which Struppi considered the highlight of their career. Yet, life apart was not easy on the young couple, and Struppi made her mind to go solo after the end of the season in order to stay with Tommy, and she began working on her own trapeze act. It was decided that Trude would keep their equipment and continue her act with her son Peter, who was now ready to perform (later her other son, Harry, joined the act). Tommy and Struppi chose to present Struppi's act on an American-Indian theme: She would enter the ring riding one of the Hannefords’ horses, dressed as a Hollywood-style Indian princess, in the manner La Tosca (Tosca Canestrelli, 1923-1994) had made popular years before for her famous bouncing ropeAn rope placed between two supports or pedestals, and fastened at one or both ends to a spring or bungee, so that the ropedancer can use the rope as a propelling device. act. Struppi had her costume designed by a Hollywood costume maker, and an original music written by the well-known circus musical director Izzy Cervone, who had just replaced the legendary Merle Evans at the helm of the Ringling Bros. and Barnum & Bailey Circus’s band. Finally, Struppi chose "Tatjana" as a stage name; it was the name of her old Russian ballet teacher, Tatyana, which is spelled Tatjana in German. When she started performing her act, Harry Thomas, the show’s announcer, introduced her as Princess Tajana, mispronouncing her name. But Tajana was actually a better name than Tatjana for an Indian princess, and Struppi kept it. 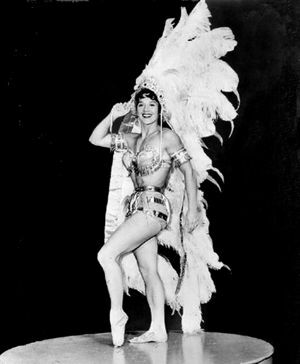 In any event, Princess Tajana’s trapeze act was a hit, and she worked with great success in all major shows in North America, including appearances on The Ed Sullivan Show in 1959 and 1961, Westinghouse/NBC’s The Mike Douglas Show in 1962, and ABC’s Hollywood Palace in 1965, among others. Princess Tajana was also featured at Radio City Music-Hall in New York City in 1971: She had become indeed a name to conjure with. Meanwhile, Struppi had also decided to build a high wireA tight, heavy metallic cable placed high above the ground, on which wire walkers do crossings and various acrobatic exercises. Not to be confused with a tight wire. act. The great high-wire artist Josephine Bersosini had retired from performing her solo act in 1962, and sold Struppi all her equipment, from cables and poles to costumes and feather fan—and even her ironing board! Struppi began training alone, and then with the high-wire artist Raúl Prada, and eventually Princess Tajana added high wireA tight, heavy metallic cable placed high above the ground, on which wire walkers do crossings and various acrobatic exercises. Not to be confused with a tight wire. to her repertoire. Around 1965, she also bought a dog act, Rudy Dockly’s Basketball Playing Boxers, which she presented as a third act. In 1965, Tommy Hanneford realized an old dream of his: He produced his first circus show. It was at Pleasure Island Park in Wakefield, Massachusetts, and all the family chipped in—with Struppi performing her high wireA tight, heavy metallic cable placed high above the ground, on which wire walkers do crossings and various acrobatic exercises. Not to be confused with a tight wire. and trapeze acts. The Hanneford Circus was born then and there, and in time, this would change the course of Struppi’s career. Tommy registered the title, and had the circus incorporated in Georgia. He then began to look for more dates. The show hit the big time the following year when it was booked for a Gary Moore show on CBS television. As they worked for Al Dobritch in Detroit in 1967, Struppi hurt her shoulder while replacing a rider at the last moment in Tommy’s jockeyClassic equestrian act in which the participants ride standing in various attitudes on a galoping horse, perform various jumps while on the horse, and from the ground to the horse, and perform classic horse-vaulting exercises. act, and eventually dislocated it when she courageously (and foolishly) tried to do her trapeze act in spite of her injury. Dislocated shoulders are an aerialistAny acrobat working above the ring on an aerial equipment such as trapeze, Roman Rings, Spanish web, etc.’s nightmare, and the trapeze act had to be put on a hiatus. Then Tommy, who saw that Struppi was a little depressed with nothing challenging to do, came up with an idea: Why wouldn’t she present a wild animal act? The only animals Struppi had ever presented were dogs, but she agreed to give it a try. Her teacher was Frank Simpson, a cat trainer(English/American) An trainer or presenter of wild cats such as tigers, lions, leopards, etc. of good reputation who presented a cage act(English/American) Act performed in a cage, such as lion or tiger acts. in the Hanneford show and also owned an animal park. Struppi’s first act consisted of small felines, leopards and pumas—less impressive, perhaps, than lions or tigers, but certainly not easier to manage. For three and a half weeks, she worked every day at the circus’s winter quarters with Simpson, and then continued alone for a couple of months before debuting the act on the Hanneford show. The year was 1972. She presented her group of pumas and leopards for about two years. Then Simpson offered Tommy a little tiger for sale. With him—he was christened "Tommy the Tiger"—and Ina, an elephant the circus already owned, Tommy and Struppi built a new act in the style of what Gunther Gebel-Williams had done with his tiger riding an elephant, and which he performed with the Ringling show which he had joined in 1970. The difference here was that Struppi was a woman… She also acquired a black leopard, Rama, which she presented on a leash, uncaged. Sadly, Tommy the Tiger, a gentle and affectionate cat, died of food poisoning, and Struppi was devastated. To console her, so to speak, Tommy purchased four young tigers, which Struppi started training with the help of Trevor Bale. Then a few more tigers were added, which Tommy trained with Struppi, and eventually a lion named Sam. This made for an impressive group. Struppi presented it until the end of the 1980 season. They were presented by Bill Golden in 1981, and then Tommy sold the group to a Texas animal dealer. 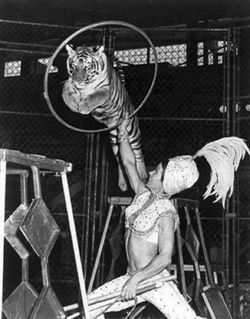 Although she still presented from time to time an uncaged black leopard named Sabu, Struppi in effect retired from performing, and became increasingly involved with the Hanneford Circus’s administration. Meanwhile, the Hanneford Circus had become the foremost producer of Shrine circuses east of the Mississippi, and had filled the place left vacant by the likes of Al Dobritch and Orrin Davenport, for whom Struppi had once worked. Renamed in 1975 Royal Hanneford Circus, it had sometimes several shows running simultaneously in different places, and provided circus entertainment for major events such as the Big E (Eastern States Exposition) in Massachusetts, and for several years, the Great Circus Parade in Milwaukee, Wisconsin, for which the Hannefords used their big tops. On January 22, 2005 Struppi was inducted into the Circus Ring of Fame on St. Armands Circle in Sarasota, Florida, in tribute to her lifetime achievements. When Tommy Hanneford passed away on December 5, 2005, Struppi continued to run alone the Royal Hanneford Circus—which she had done increasingly when Tommy’s health started deteriorating. In turn, Struppi’s health began to decline: she was diagnosed with a colon cancer. She fought it valiantly, as was expected of the strong woman she was, but to no avail. Struppi Hanneford died in her sleep on November 1, 2014 at her home, in Sarasota, Florida—or more precisely, in her living home on wheels, where she chose to stay at the very end of her life. She was eighty-three years old. Her adopted daughter, Nelly Hanneford-Poema, a circus performer herself, was at her side. (Nelly is the biological daughter of Struppi’s sister-in-law, Kay Frances Hanneford (1933-1976), who had been Tommy’s partner in many of the family acts, and had died prematurely at age forty-three.) Tommy and Struppi’s grandchildren, Catherine, Mariana, Adrian Jr., and Tommy Poema, continue the Hanneford tradition.